Men of Peace is written by thirty-two men who refused to become members of the United States armed forces during World War II. They tell what led them to refuse induction and choose to labor for no pay or go to federal prison during the conflict. We discover what influenced them in early life and how they managed during the following decades. By the end of this book we can look back on social changes that they have made and what impact these intelligent humanitarians have had on our present day society. Men of Peace is an incredible gift—informative, inspiring and important. The personal journeys of these brave pacifists make clear the courage and sacrifice we must muster to face the challenges of the 21st Century. Thanks to this book, these stories will now live on in our hearts and minds. Mostly absent from the stories told of the “Greatest Generation” are the stories of the men—and sometimes women—who had to be brave enough to stand against the sentiments of their nation, neighbors, and even their families to say “No” to the most popular war in modern history. Men of Peace continues my decades long quest of making the story of those conscientious objectors to war be recorded and heard so that we all can learn from them. Stories are important and stories from this group of people, who were in some ways ordinary but always extraordinary in how they lived their beliefs, are especially important. People’s stories usually reveal more truth than their sermons or essays about religion or philosophy. We are changed and enriched by reading these stories and the influence of these men is enduring. Men of Peace is a vivid portrait by and about the courageous men who said no to war, even WWII, our “good war.” With hope, their experiences will help illuminate alternative paths for future generations. —Murray Polner, author of No Victory Parades: The Return of the Vietnam, and with co-author Thomas Woods, Jr., We Who Dared To Say No To War. We live in a “warist” world, that is, a world of deep prejudice that takes war for granted. War is simply what nations do, and most nations—especially the United States—take great pride in doing war very well. Like racism and sexism, “warism” is poisonous. It distorts our judgments and leads many to rationalize behavior we may not have chosen had we been free of the bias favoring our endorsement of war. War has been sold as our sacred obligation, especially World War II. As WW II veterans have aged they have come to be called “the greatest generation.” In this book we hear from men of that same generation who marched to a different drummer, who stood against participation in war and did so as a matter of moral conscience, who swam against the prevailing current, no small undertaking in the United States, the dominant military nation on earth. Since the 1960s, that is, since the height of political resistance to the U.S. war in Vietnam, moral rejection of war—pacifism—while not commonplace has become somewhat accepted and expected. But in the 1930s and 1940s, during the build-up to and through the duration of World War II—the good war—pacifists were an endangered species. Young men were under particular pressure to serve their country in the effort to stop Hitler and the Nazis. Still, thousands refused to register for the draft and thousands more registered as conscientious objectors (COs), most often on religious grounds. During World War I, COs often ended up in prison for refusing military service. By the beginning of World War II the traditional peace churches had secured provision for CO registration with Selective Service. If the CO status was approved by the candidate’s local draft board, he was subject to the draft, but assigned to “alternative service doing work of national importance.” The Quakers, Mennonites, and Brethren sponsored and directed Civilian Public Service (CPS) camps wherein COs served the country working in hospitals and schools, doing forestry, teaching in poverty areas, helping in mental institutions, and even serving as medical test subjects for studies on hepatitis, starvation, sleep deprivation, lice treatment, and more. Some COs resented the “slavery” of the CPS camps where wages were unheard of, and tiny allowances of a few dollars a month “pocket money” were typical. A few resisters simply walked out of the camps, going AWOL at first, and later, to prison. Some COs organized to resist the peace church cooperation with Selective Service in providing and administering the alternative service camps, arguing that a more radical resistance to conscription was needed to witness against war. The musings of the CPS “veterans” on the politics of alternative service is a window into a missing piece of American history. 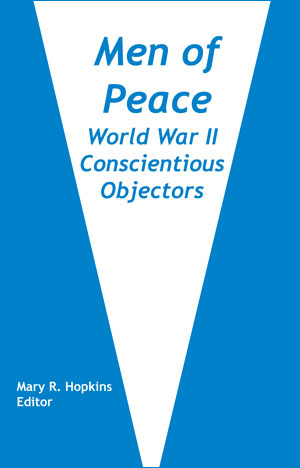 Men of Peace gives over thirty WW II COs an opportunity to tell their own stories of conscientious objection, and to do so in their own words. These are stories rarely told beyond immediate families and close friends, stories lost and neglected, stories left out of most textbook accounts of World War II. This collection of first-hand accounts gives readers a glimpse into the lives of pacifists who somehow found the courage to question and even reject war on ethical grounds. Often their ethics followed their religious upbringing, whether they had grown up in a traditional peace church (i.e., Quakers, Mennonites, or Brethren) or as Methodists, Congregationalists, Presbyterians, Lutherans, Catholics, or Jews. Sometimes the moral position came out of less structured spirituality and even from secular moral reflection without reference to organized religion. Always individuals followed their conscience. For some it was easy, but others struggled through torturous decision-making processes. Some felt supported by family and friends, but many were quite alone without pacifist parents, friends, or mentors. Some suffered no ill effects of choosing conscientious objection while others lost jobs, relationships, and even careers due to prejudice against pacifism. Each individual’s experience is unique. Together these personal stories are pieces of a much larger mosaic, the mostly invisible history of American moral resistance to World War II. Readers will find fascinating the variety of lives led by these COs following the World War II conscientious objector experience. Many were and are activists in subsequent anti-war efforts, but others have not been activists. Several have made significant contributions to dismantling America’s racial segregation practices and many participated in the U.S. Civil Rights movement. Some have worked in international development to end colonialism or to reduce hunger and achieve self-sufficiency among ordinary people in “developing” nations. Many have worked—and continue to work—on behalf of various organizations, such as, the Fellowship of Reconciliation, the Congress on Racial Equality, the Alternatives to Violence Project, and many, many others. Happily, Editor Mary Hopkins provides very useful endnotes wherein a host of acronyms are spelled-out, organizations explained, and dropped names are identified with short biographies. The index at the end of the book proves helpful as well. The book is so rich with information that many will begin researching through the index and find themselves drawn into the personal stories. Historians, peace advocates, pacifists, students, as well as general readers will find this well worth their time. Since each man of peace tells his own story in his own words, selections vary widely in style and content. All follow one broad format, but each respondent goes his own way. The result is a bit uneven but all the more rewarding for the genuineness that radiates from every page. Perhaps most remarkable is that the authors range in age from their late eighties to their mid nineties. The cumulative effect of reading every selection is powerful. We can only hope that we might accomplish half as much in our lifetimes and be as articulate, generous, and open in passing our stories to future generations. This is an important book. Readers will be grateful for the men of peace who first lived, and now share, these experiences, and to Mary Hopkins for her persistence in seeing this project through to publication while these men of peace were still available for their testimonies. A reading of Men of Peace will provoke more than a few smiles, more than a few tears, and, one can hope, many, many young people to think hard about who they are and where they stand on war. For this last result, future generations will be forever grateful. Mary R. Hopkins, using her Master’s degree in Social Work, has focused her adult studies on religion, psychology, and art from a woman’s point of view. This work culminated in the video tapes entitled, Women and her Symbols and Mother Earth: Revisioning the Sacred. She was very active in Quaker organizations, resulting in her papers being included in the Friends Historical Library at Swarthmore College. Charmed and inspired by Calhoun Geiger’s memoire, she was led to compile stories from other World War II conscientious objectors. When she moved into a Quaker retirement community, she found the wisdom and resources necessary to complete this book.